The past two weeks have produced some great fishing for both salmon and sturgeon, lots of big sturgeon being caught in the 5 to 8ft range as well as plenty of Pink salmon. 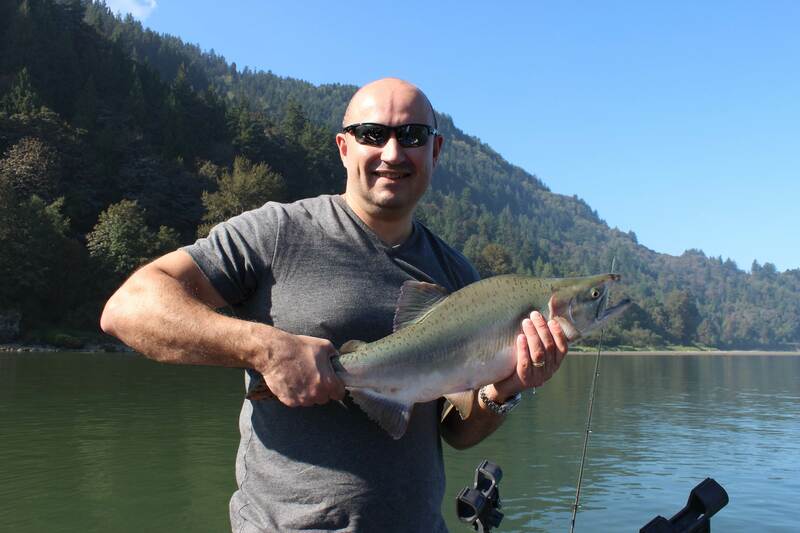 The Saltwater has been producing some great results for Chinook and a few Coho starting to show up. The Pink salmon run has just been upgraded to 26 million so still lots of fish to come. I would expect this great fishing to last well into October. See below for detailed report. 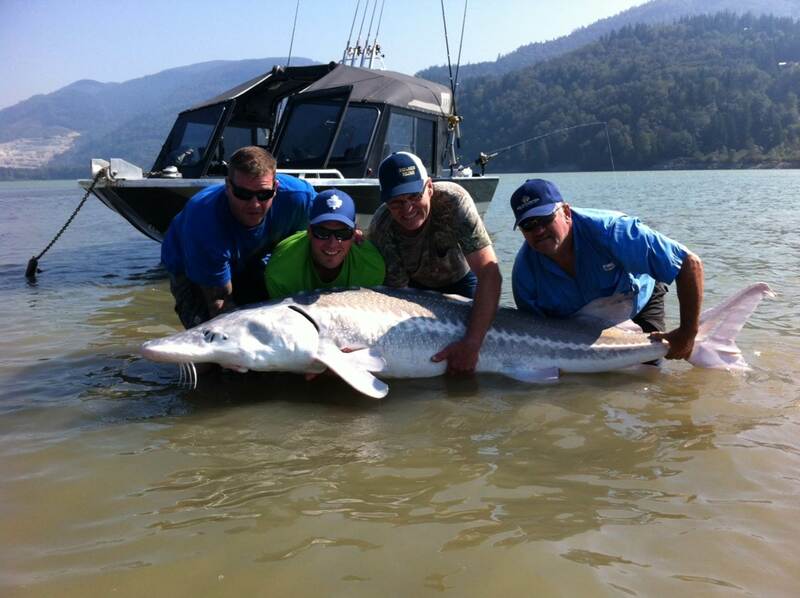 Fraser River Sturgeon fishing has been incredible to say the least, all of our guides are landed big fish between 6 to 9 feet with an 8ft 6, 8ft 10 and a 8ft 11 landed this past week. Best bait has been Pink Salmon parts which would include eggs, belly strips, gills and salmon heads. I would not waste my time with other baits right now as Pink salmon is the main food source right now. A rare long nose canyon fish has made it’s way down river, great fish guys. 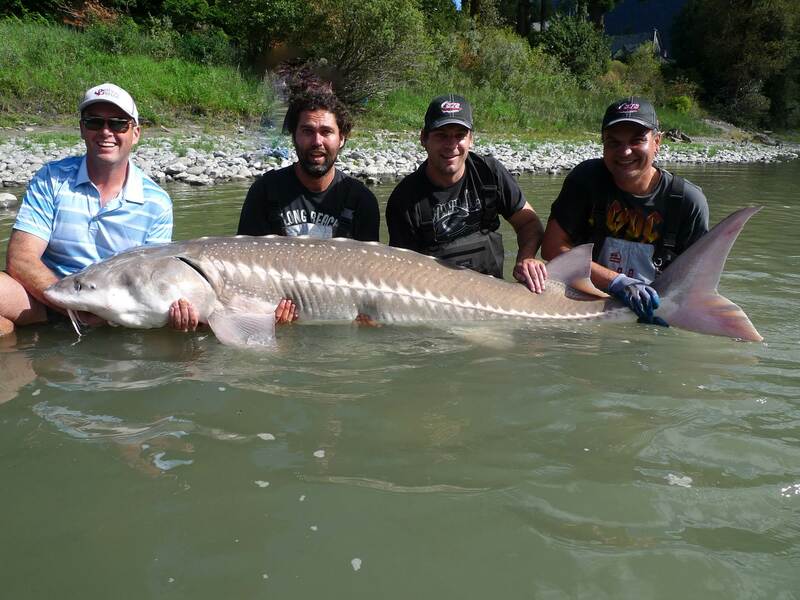 We are now experiencing some of the best sturgeon fishing that we have seen in a while, big sturgeon are feeding heavy on Pink salmon. 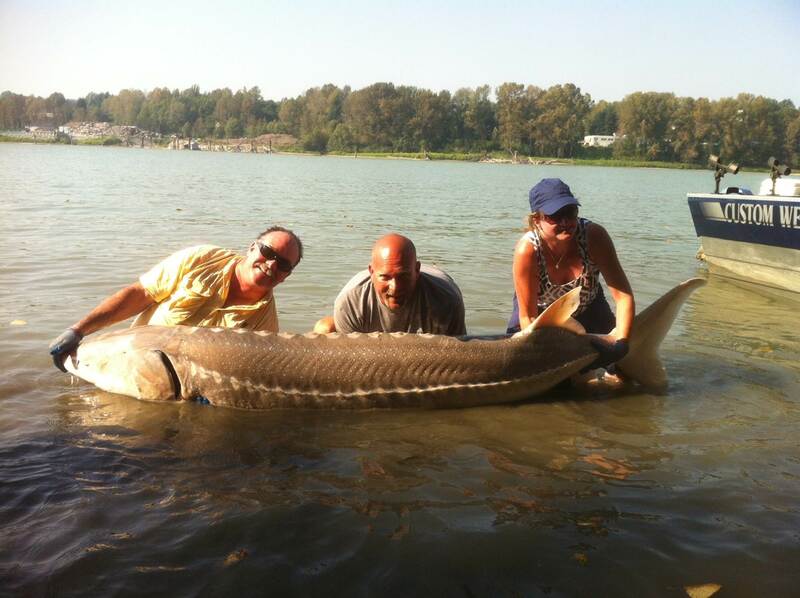 Strategies for finding these big fish are quite simple, find Pink Salmon spawning or staging and you will find sturgeon. I have been catching big fish in 5 to 9 feet of water so don’t just look at big deep holes, try fishing the shallow water near a gravel bar or anywhere you see Pink Salmon splashing and rolling. Lots more to come , Pink salmon run has just been upgraded to 26 million. Salmon fishing has been excellent this past week, lots of pink salmon around and more to come. This is turning out to be the largest run since the mid 90’s so enjoy while it lasts. You can catch these salmon just about anywhere on the Fraser from Surrey all the way to Lillooet. These fish can be caught on the fly, spin casting or trolling. The key to catching these fish is a slow presentation, regardless of gear choice, slow retrieve is the key. My favorite lure for Pink salmon is the Gibbs/Delta Ultra Lure in 1/4 for water less than 5 feet deep and 3/8 for 5 to 7 feet of water. The key is super slow retrieve and cross current presentation. Cast across the current and allow the spoon to sink slowly while your retrieving. This presentation is very productive once you get the feel for it. I had to throw in another sturgeon picture, they are so awesome. 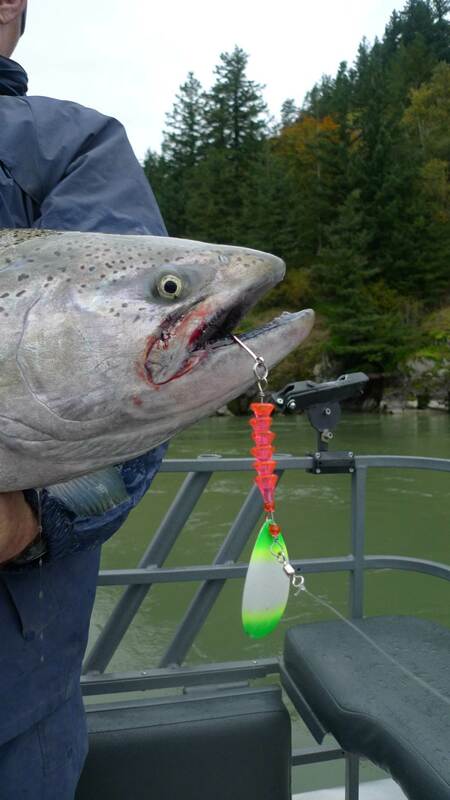 Chinook Fishing is improving by the day, lots of big Harrison Fish starting to move through the system, now through until middle of October is best for Chinook Salmon. We use many methods but plunking spin n glo’s or spoons is probably best choice until water clears a bit more. 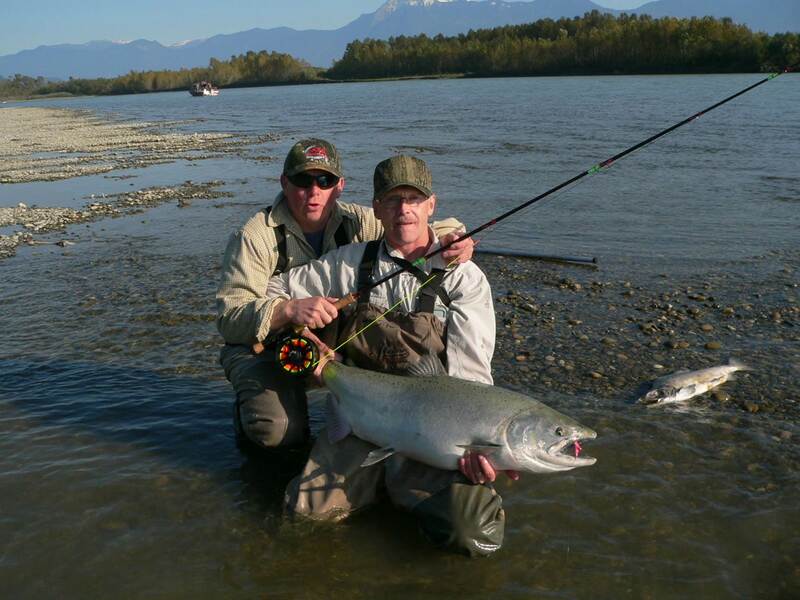 If you are wnating to try your luck for Chinook Salmon, Sept 21 through to October 15 is best. Here is a fly caught Chinook from a few years ago, what a great fish. Local rivers such as the Vedder and Chehalis are full of Pink Salmon which can be caught using fly or spinning tackle, you can also float fish for these fish. These fish are great biters so there is no reason for anyone to be bottom bouncing for salmon right now. Time to put that away and get out the fish gear. 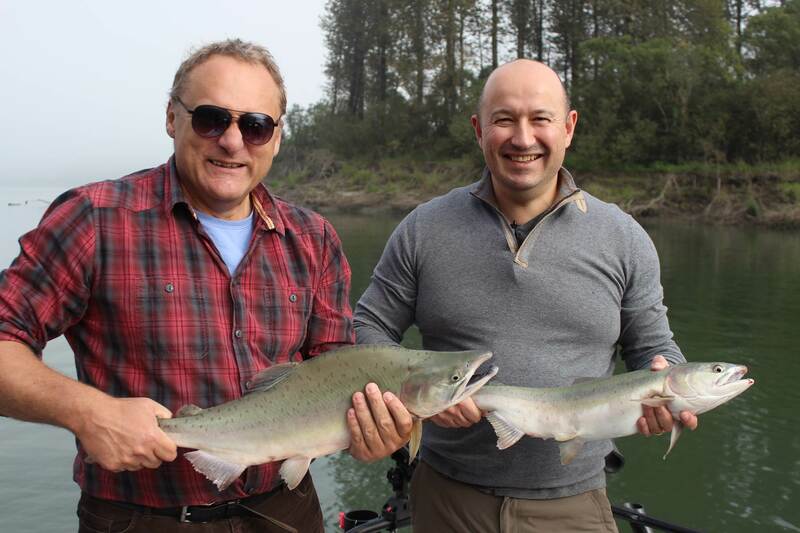 You are currently reading Sept 14 fishing update at Hells Gate Jet Boat Tours Blog.